I am absolutely in LOVE with this bag! (Evidently, I am one of few because everyone else hated it on another subforum). Anyways, the cheapest I can find a REAL one for is $500 and that is way out of my price range for this kind of casual, nylon bag. Does anyone know where I can find a better price??? THANKS!!! On a separate note, there is a GREAT bag in the US Weekly that has Jessica and Nick on the cover..I think the headline is something about Nick stealing Jessica's millions....there is a page on the right side where Jennifer Aniston is pictured with a black handbag...does anyone know whos it is? Maybe bottega?? 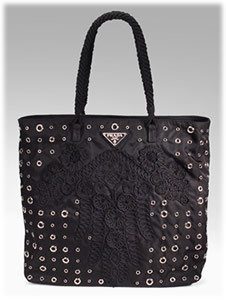 actually, $500 for this bag is already a pretty good deal. There's some similar bags on Bluefly. But I agree...$500 for a prada is pretty good! 2) I think the Aniston back you're referring to is a bag that's been previously discussed. It's a BV that's no longer available. If you search the forum and try "Aniston" as your search term, you should find the threads. Thats a 1200.00 bag! 500 is a steal!